This week’s episode of Mad Genius Tips spotlights an amazing feat of brunch innovation: the bacon cinnamon roll. It’s a sweet-and-savory, crispy-gooey meeting of two classic brunch dishes. Here, eight more incredible hybrid brunch dishes. This irresistible breakfast is a cross between an egg salad sandwich and an Egg McMuffin. 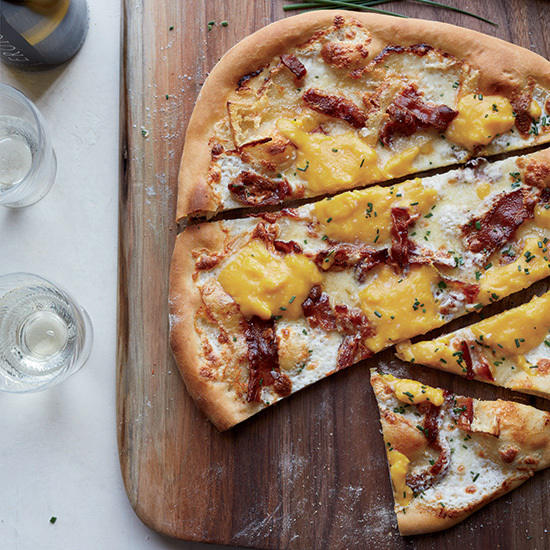 Transform pizza into a perfect brunch dish by topping it with crisp bacon, custardy scrambled eggs and two cheeses—Brie and mozzarella. This fluffy, nutty dish is a playful mash-up of French toast and PB&J. Hearty and crazy-satisfying, this savory bread pudding combines all the classic breakfast sandwich ingredients—bacon, egg and cheese. Instead of serving pancakes with a side of ham, mix chopped up ham into pancake batter for sweet-and-savory flapjacks. This outstanding Vietnamese banh mi includes duck pâté and spicy pickles along with two unconventional accouterments: five-spice-flavored bacon and a fried egg. The classic, cheesy ham sandwich meets gooey bread pudding in this terrific dish. This recipe combines three sandwiches into one—BLT, fried egg and grilled cheese.